The MAC Illustrated Collection has launched exclusively at Nordstrom as you know. This is the color collection that won’t be available anywhere else other than Nordstrom. The MAC Illustrated Bag Collection is an extension of the color collection at Nordstrom and will be available exclusively for a limited time at MAC stores. The collection consists of six bags designed by three artists. I’m not a terribly big fan of these designs myself however, they do prove roomy options for toting makeup essentials around. The first bag pictured is the MAC Illustrated Small Bag by Nikki Farquharson ($35) and the second is the MAC Illustrated Petite Bag by Julie Verhoeven ($30). I think the bags are a bit on the pricy side and as I mentioned not really an art design that I’m terribly interested in. However, if their your bag, literally, you can find them at MAC store locations for a very limited time. 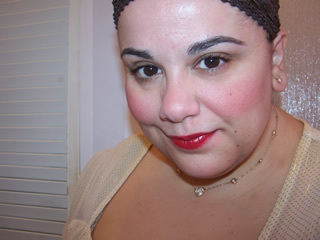 I bought the Julie Verhoeven bag in “Peach” containing my HG lipstick “Ravishing.” I ended up taking the kit back, though. The lip liner was damaged and the lip gloss, both brush design & color, were very disappointing. A big disappointment for me. First time I ever took a MAC kit back. so so sorry susan 🙁 if you just want the bag they are available now at the least! I am definitely not a fan of either one. The one with the face is a tad creepy. I thought the Julie Verhoven bag was kinda cute but I mainly got it for the lip products inside (and it was a pretty good deal, 3 lip products and a bag under $40). I don’t like the one with the face. The other one is alright. But I wouldn’t buy either of these, really. Except for because of what’s inside. I love the Nikki Farquharson one–and also the marigold (or chrysanthemum?) print ones. So cute! I just don’t get the appeal of these at all. Would love a Camille Rose Garcia one! But MAC doesn’t do edgy, niche things much anymore so I am not holding my breath.